Modern day comfort, fused with the mystique and magic of the bygone days of Africa: that is Mombo Trails Camp in a nutshell. With no permanent structures, this camp offers you a bit of nostalgia, looking back to the roots of safari pioneers. Originally, Mombo Trails Camp was erected to provide accommodations during the renovation of Mombo Camp. Nowadays, the camp celebrates the long history of Mombo (that means ‘place of plenty’) as one of the longest running camps, with plenty of the present to enjoy. Being in the middle of some of the best wildlife viewing areas in Africa, spectacular game drives are scheduled for mornings and evenings. In between, there are long stretches of extensive brunches, reading, slowly drifting to sleep with a background of birdsong, viewing wildlife from the comfort of your own deck – topped off with excellent cocktails and dining under the stars. You will find all the luxury and comforts of a Mombo experience, along with Mombo’s world-famous game viewing. Seven elegantly furnished and spacious guest tents (fourteen beds all together) immediately get you in the right safari mood. Sleeping under canvas, hearing hippos calling at night: indispensable experiences for an authentic, Botswana safari. All luxury tents are elegantly furnished and boast en-suite shower facilities with double vanities. The tents are situated on raised decks to minimise impact on the site. Protected by large, shady trees, your private deck is the perfect spot to grab the binoculars and gaze at a variety of the area’s wildlife. Under impressive jackalberry trees, the central living and dining area also overlook the floodplain. The small library is an inviting nook to read about the area’s birdlife or to write in your safari diary (and you will have plenty to write about). All areas offer a casual, back to nature ambiance, where you can kick off your shoes and relax between activities. Home cooked and heart-warming meals are enjoyed under the African night sky – would you want it any other way? After dinner, join Mombo regulars, guides and staff around the campfire to relive the history of Mombo. 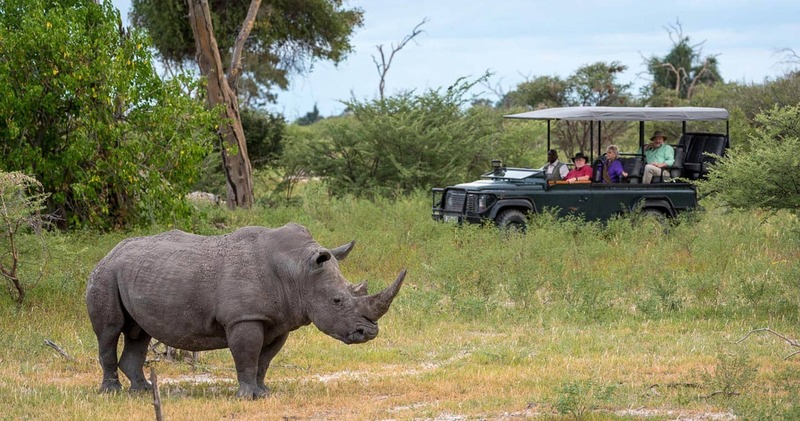 With wildlife in abundance, Mombo Trails Camp focuses completely on game drives in 4x4 open safari vehicles, where window seats are guaranteed for every passenger. During game drives in the early morning and afternoon, you will find yourself amazed at the wealth of wildlife in this densely inhabited area: from herbivore concentrations – especially of red lechwe, plains zebra, giraffe and impala – to one of Africa’s highest density lion populations. Spotted hyaena and leopard are other frequently seen carnivores. The excellent guides and trackers of Mombo Trails Camp assure you of a front row seat to witness it all. With the lively Okavango River splitting into its primary channels just upriver from Mombo, you are in the middle of the Delta’s most fertile areas. Swamps, marshes, floodplains, riverine woodlands and dry woodlands: it is all here.. Did we mention Mombo means ‘place of plenty’? Lastly, the food and accommodations at Mombo are the best. Nothing to want or need. If you want wi-fi and facebook - I don't even know if internet is available - you are in the wrong place. This is Africa untouched. As it has been for centuries. Come and enjoy and respect where you are. Our ranger Yompy became more funny everyday and had a huge knowledge of the birdlife of Botswana. As my wife and me are v ery much into birding it was a pleasure to do drives with him, learn about the nature and have a good time. The room was perfect and well worth the money. I couldn't imagine anything to dislike in this camp, but you must be into wildlife more than in other camps as this is set so deep into nature, that there is a Hyena in the camp (even using the walkways sometime), Elephants walking through Trail bridges, serval cats, baboons, squirrels and mice crossing our ways day and night. Perfect for us. Mombo Trails is 100% solar-powered, in line with the camps 4Cs vision. Wilderness special offer: Greatly reduced rates are available when combining Mombo Trails Camp with any other safari camp operated by Wilderness safaris. Please see our specials page for an overview of combination options. Reduced rates are displayed below. 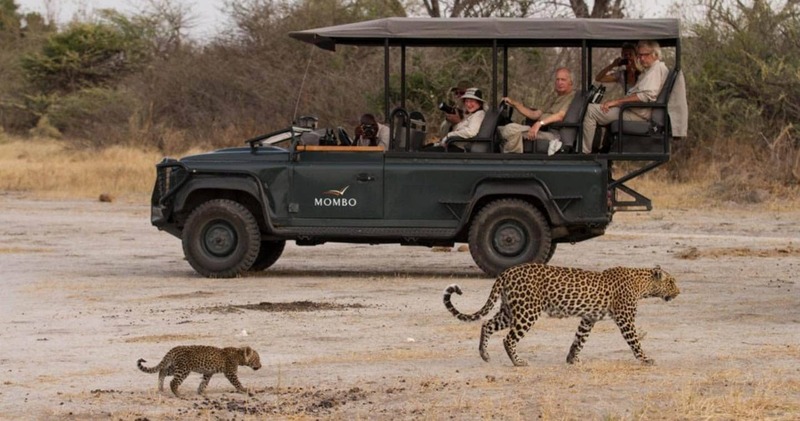 Read all about travelling to Mombo Trails Camp on our getting to Moremi page. Mombo Trails is best accessed through Maun Airport. Minimum age of children is 6 years old. We hope you have found all information needed to decide that Mombo Trails Camp in Moremi Game Reserve is the perfect place for your next travel adventure. Please fill in the contact form and we will get back to you soon!